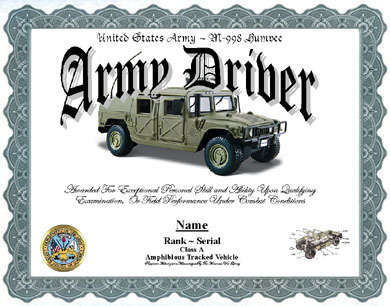 An unaltered photocopy of your DD-214, WD AGO, NAVPERS, NG or other military issued document clearly displaying your Army Driver, Humvee authorization. 1. DESCRIPTION: A white metal (silver, nickel and rhodium), 1 inch in height and width, a cross patee with the representation of disk wheel with tire placed on the center. a. Basic criteria. The Driver and Mechanic Badge is awarded to drivers, mechanics, and special equipment operators to denote the attainment of a high degree of skill in the operation and maintenance of motor vehicles. b.Badge approval authority. 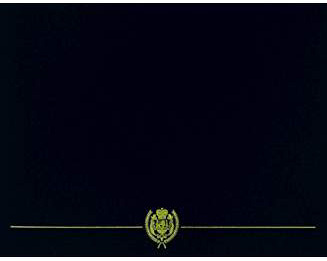 Commanders of brigades, regiments, separate battalions, and any commander in the rank of lieutenant colonel or higher. (1) Driver-W (for wheeled vehicles). (2) Driver-T (for tracked vehicles). (4) Driver-A (for amphibious vehicles). (5) Mechanic (for automotive or allied vehicles). (6) Operator-S (for special mechanical equipment). (1) Qualify for and possess a current OF 346 (U.S.Government Motor Vehicles Operator's Identification Card), issued as prescribed by AR 600-55. (3) Perform satisfactorily for minimum period of 1 year as an active qualified driver instructor or motor vehicle driver examiner. Occupy a duty position with title of driver or assistant driver of Army vehicles for a minimum of 12 consecutive months, or during at least 8,000 miles and had no Army motor vehicle accident or traffic violation recorded on his or her DA Form 348R (Equipment Operator's Qualification Record (Except Aircraft)). (1) Pass aptitude tests and complete the standard mechanics course with a skilled rating or have demonstrated possession of sufficient previous experience as an automotive or engineer equipment mechanic to justify such a rating. (2) Be assigned to primary duty as an automotive or engineer mechanic, unit level or higher, or is an active automotive or engineer mechanic instructor. (3) If required to drive an Army motor vehicle in connection with automotive mechanic or automotive mechanic instructor duties, qualify for motor vehicle operators permit as prescribed above, and perform duty which includes driving motor vehicles for a minimum of 6 consecutive months, and has no Army motor vehicle accident or traffic violation recorded on his or her DA Form 348 (Equipment Operator's Qualification Record (Except Aircraft)). f. Eligibility requirements for operators of special mechanical equipment. A soldier or civilian whose primary duty involves operation of Army materials handling or other mechanical equipment must have completed 12 consecutive months or 500 hours of operation, whichever comes later, without accident or written reprimand as the result of his or her operation, and his or her operating performance must have been adequate in all respects. 1. THE PURPOSE OF THIS MESSAGE IS TO PROVIDE THE POLICY CLARIFICATION ON CHANGES TO AWARD OF THE DRIVER AND MECHANIC BADGE. 2. A CHANGE TO THE REQUIREMENTS FOR AWARD OF THE OSR HAS ELIMINATED THE POLICY THAT RESTRICTED AWARD OF THE OSR WHEN ANOTHER CAMPAIGN/SERVICE MEDAL IS AWARDED. EFFECTIVE IMMEDIATELY, PARAGRAPH 5-4D, AR 600-8-22, IS RESCINDED. (3) PERFORM SATISFACTORILY FOR A MINIMUM PERIOD OF 1 YEAR AS AN ACTIVE QUALIFIED DRIVER INSTRUCTOR OR MOTOR VEHICLE DRIVER EXAMINER.